Enjoy a Bhutan Weekend Trip and experience the beauty and the peace of our country.This activities Pack tour includes a forest or village hike as well as a rafting trip on the Mo chu river. 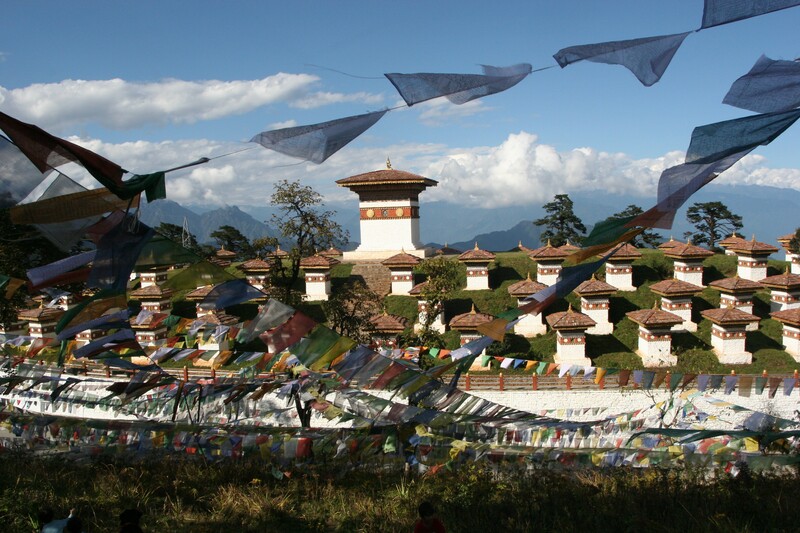 This tour is designed for expatriates working or visiting Bhutan. It can only be booked by those who are already in Bhutan or planning to visit for work or a conference. The price does not include any royalties. 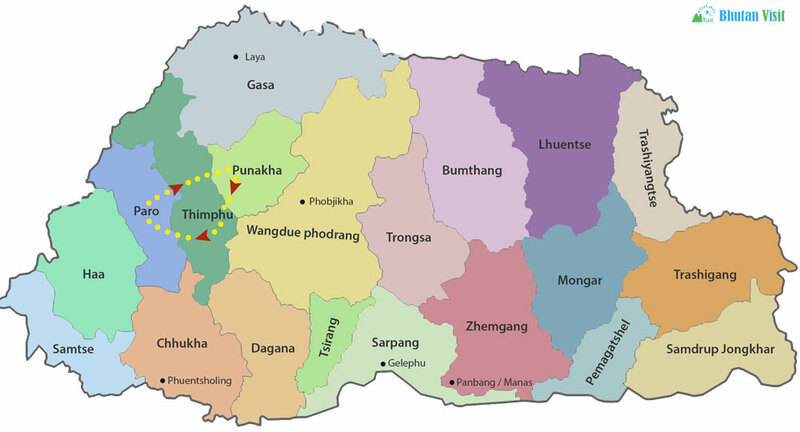 Morning departure from your Hotel for the drive to Punakha (2½hrs driving time).A one-hour drive from Thimphu brings you to the Dochula Pass at an altitude of 3,000m. Stop to circumabulate the 108 chorten and enjoy the view of the Himalayan peaks in the distance. A two-hour hike brings you to Lungchutse temple. Return back to the pass (1 hr). Lunch will be served at the cafeteria. Continue the drive until you reach the small town of Lobesa. From here, take a lovely stroll through rice fields and villages in this semi-tropical region and visit Chimi Lhakhang, the temple of 15th Century Lam Drukpa Kuenley, the “Divine Madman”. Your guide will tell you more about his unconventional teachings. On your return from the temple, stop for suja, a red tea with butter and salt, at a farmhouse. 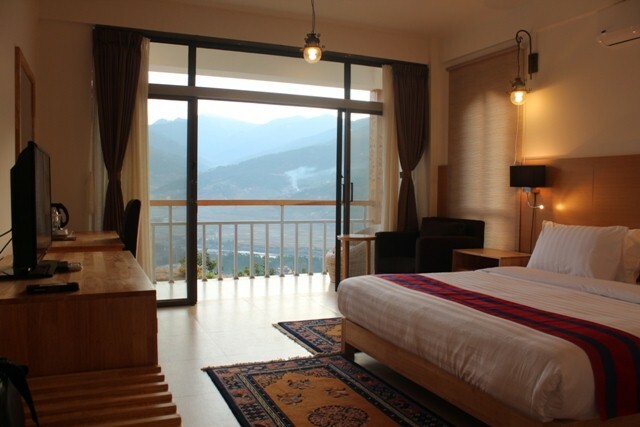 Drive to your hotel, with a great location looking down upon the Punakha Dzong. Relax before dinner which will be served at the hotel. In the early morning sunshine take a short hike to Khamsum Yuelley Namgay Chorten through paddy fields and villages. It is about a 30-minute hike up to the temple from where you will enjoy beautiful views of the river and valley below. On your return from the stupa you will be at the starting point for the rafting excursion. Take a 1½-hour rafting on the Mo-chu (Female) river. You will be provided with helmets and life-jackets but you are not expected to get wet during the trip, since the river is not too rough. Stop for lunch in Kuruthang town. After lunch, visit Punakha Dzong, which was the former fortress capital of Bhutan. The monks live here during the winter months, moving from their cooler summer residence in Thimphu Dzong. If you still have some free time, you can opt to visit the Kuruthang stupa before driving back to Thimphu (2 – 2½ hrs).